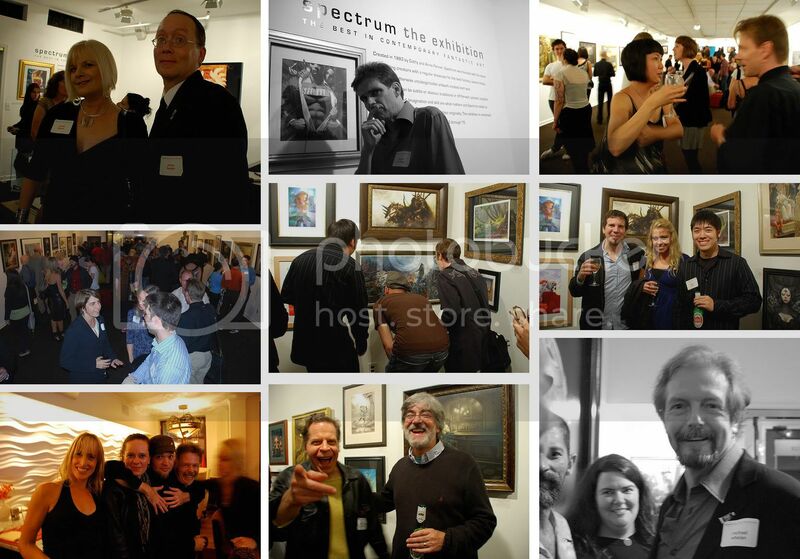 Last Friday night was the opening reception for the second Spectrum Exhibition at the Museum of American Illustration at the Society of Illustrators. The Spectrum annuals have arguably become the standard of science fiction and fantasy art over the past decade and a half. Over a hundred works of art selected from the last four editions of Spectrum are on display through October 17th. The fun part of curating the exhibit is pouring over each volume and debating the merits of each and every image. The heartbreak is not be able to include everything we felt worthy -- space limitations meant having to exclude excellent work, much of it by dear friends. What we hope to have on display is a small taste of the breadth and of richness of genre art, including John Howe, John Jude Palencar, Phil Hale, Kinuko Craft, Andrew Jones, Yuko Shimizu, Rebecca Guay, Tony DiTerlizzi, Donato Giancola, Michael Whelan, Jon Foster, Rick Berry...and a hundred others. The reception was, in a word, a blast! Artists and industry peoples came in from all over the states and across the pond. (Special props to California -- the Golden State must have weighed more than a few pounds lighter last weekend.) The party started at 6:00 and was going strong till midnight. It was a great opportunity to meet new contacts and to connect with old friends I normally only see within the chaos of ComicCon. A huge thanks to all the participating artists. Our lives would be a touch duller without their visions and to see them in the original is an immeasurable treat. Greg Manchess, Cathy and Arnie Fenner, Arkady Roytman and I owe a huge debt of gratitude to the Society of Illustrators staff. Not only for opening their doors to the us, but for doing all of the un-fun parts while we sat back and handed wish-lists over (rarely on-time, at that) and constantly raising the bar on all aspects of the exhibit. The doors are open Tuesday through Saturday, after work hours on Tuesdays. And it's free! Stop in, take a look at the show and see all the other events the Society has to offer: life drawing sessions, lectures, networking, workshops, and a permanent collection of 2,000 paintings from the likes of Rockwell, Schaeffer, Cornwell, Wyeth, Fuchs, Pyle. Irene, thank you SO much for organizing this. It was a fantastic show, and I am really honored to be a part of it. School year has just started at SVA, and I told all my students to go see. It is really great to get lost in the beautiful brush strokes. I really admire artists who do great on things I can never do. I had a blast at the opening too, and met some really nice people. Thank you again. Was great seeing you again, Irene, the show is fantastic, I can't wait to make it back up to NY so I can go through it again! I feel like I barely saw anything, was so busy socializing :x I love the pictures from the AOL, I really wanted to make it back up for it but I just couldn't. I can't wait to see the Donato piece of you done! You must've been geeking out about it heh.